Colin Powell’s decision to back Barack Obama in the U.S. elections has sparked controversy, but both parties would do well to act on the detail of what he said, says John Bourke, political analyst for RT. 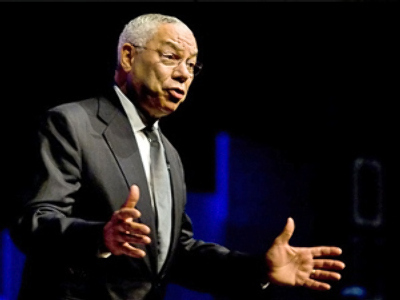 The decision by the former U.S. Secretary of State Colin Powell to endorse Barack Obama was not, in truth, a great surprise in itself. It had been widely rumoured for some weeks. What was, however, particularly pointed about it was the way in which Powell took just about everyone involved to task in such a comprehensive and scathing manner. He could quite easily have issued a simple statement via his press secretary and indeed held no interviews with anyone at all. Instead he chose the very public forum of the top Sunday morning political chat show in the U.S. as his platform to hold a live interview where he proceeded to take apart, piece by piece, not only the McCain campaign, but his vice presidential running mate, the manner in which the campaign was being run and, finally, the entire Republican Party itself. He criticised Senator McCain for not being able to grasp the economic woes facing the country or offer the public a clear and coherent response to the problem. He criticised Governor Palin for clearly not being qualified for the job (not to mention what this said about McCain’s judgment, he added). He further criticised the negative tone of much of the McCain campaign, specifically decrying their attempts to somehow smear Obama with so called associations to the likes of 1960s radical Bill Ayers, and finished off by commenting that he was uncomfortable with the way in which he felt the entire Republican Party was being taken over by the right wing. Had he been issued with a list of talking points by the Obama campaign he could scarcely have done any better. And yet this is a man who was at the forefront of the Bush Administration’s decision to go to war with Iraq. For the McCain campaign, already around 6 points down in the polls nationally, this cannot have come as good news. But, as if things could not get worse, along comes the little-known Republican Congresswoman Bachmann of Minnesota. When interviewed a few days later she not only dragged up the same negative campaigning linking Obama to Bill Ayers but ended up suggesting that the media should carry out an investigation into all members of the Congress to establish which ones are un-American. Quite what her definition of un-American is she did not explain, but presumably it goes somewhere along the lines of what she thinks is American and isn’t. Also puzzling was the linking of liberal to anti-American in her argument. This is a not an uncommon theme that is now surfacing in the election. It comes hot on the heels of the Republican North Carolina Representative Robin Hayes’ now infamous comments when warming up a rally for McCain about how “liberals hate real Americans”. It is unfortunately a disturbing reflection on how bitter this presidential race has become and the increasing fury on the part of the right that someone like Barack Obama might win. The notion that any one huge group of people, be they liberals or conservatives, could now be hinted at as being unpatriotic is unquestionably a dangerous direction for any democratic election to head in. And with two-thirds of people polled expressing unhappiness with what they perceive as the increasingly negative tone of the McCain campaign, it poses a worrying question here of where the country will be left afterwards – no matter who wins this race. Colin Powell’s comments seemed to sum it up perfectly. “If you’re an American you’re an American,” he said, “and this business, for example, of a Congresswoman from Minnesota who is going around saying let’s examine all Congressman to see who is pro-America and who is not pro-America – we have got to stop this kind of nonsense, pull ourselves together and remember that our great strength is in our unity and in our diversity”. However, with both parties already admitting that U.S. politics has become more partisan and bitter now than ever before, the concern is that, if both sides keep on digging in deeper and deeper, there will be little left to govern afterwards. The ability to run an effective government of any kind that can solve the real problems people are facing will become an almost impossible task no matter who wins. When the party activists on both sides have packed up the placards, stopped shouting at each other and gone home, ultimately it will be the ordinary public who will be left behind to pick up the pieces.